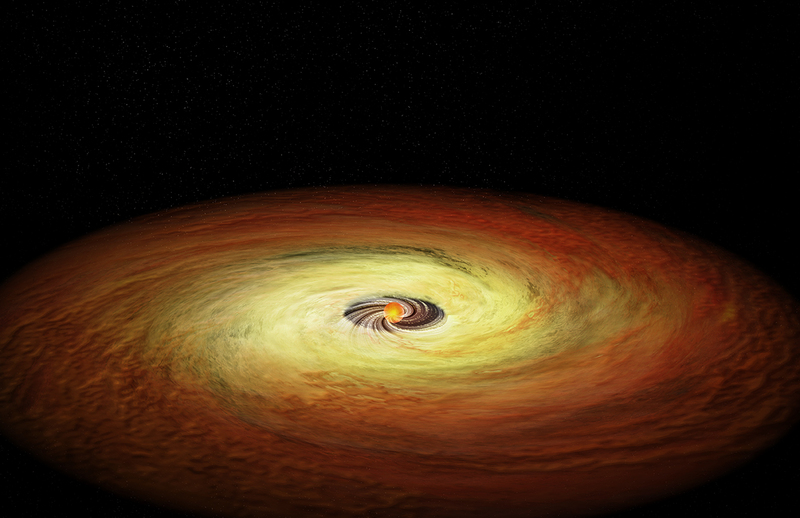 Young stars less massive than the Sun can blast planet-forming disks surrounding them with powerful amounts of X-rays. Scientists often look for exoplanets around such stars because they have properties more favorable for detection. This result reveals clues about the star formation process and the survival rate of planet-forming disks. 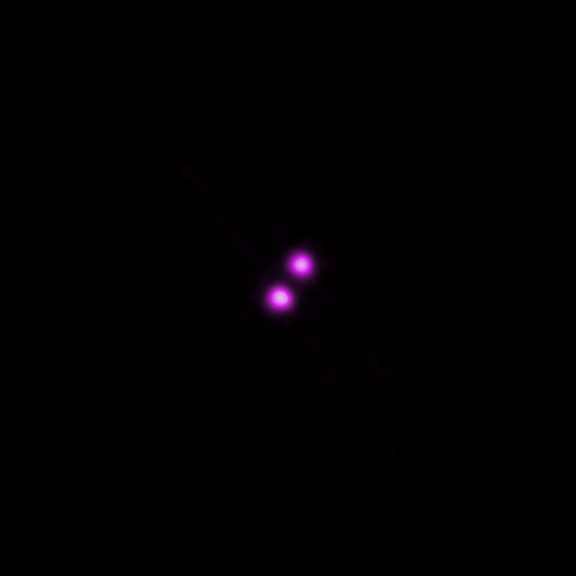 Chandra data was used to look at the intensity of X-rays produced by the stars and infrared data showed whether the system had a planet-forming disk. Young stars much less massive than the Sun can unleash a torrent of X-ray radiation that can significantly shorten the lifetime of planet-forming disks surrounding these stars. This result comes from a new study of a group of nearby stars using data from NASA's Chandra X-ray Observatory and other telescopes. Researchers found evidence that intense X-ray radiation produced by some of the young stars in the TW Hya association (TWA), which on average is about 160 light years from Earth, has destroyed disks of dust and gas surrounding them. These disks are where planets form. The stars are only about 8 million years old, compared to the 4.5-billion-year age of the Sun. Astronomers want to learn more about systems this young because they are at a crucial age for the birth and early development of planets. Another key difference between the Sun and the stars in the study involves their mass. The TWA stars in the new study weigh between about one tenth to one half the mass of the Sun and also emit less light. Until now, it was unclear whether X-ray radiation from such small, faint stars could affect their planet-forming disks of material. These latest findings suggest that a faint star's X-ray output may play a crucial role in determining the survival time of its disk. These results mean that astronomers may have to revisit current ideas on the formation process and early lives of planets around these faint stars. Using X-ray data from NASA's Chandra X-ray Observatory, the European Space Agency's XMM-Newton observatory and ROSAT (the ROentgenSATellite), the team looked at the intensity of X-rays produced by a group of stars in the TWA, along with how common their star-forming disks are. They split the stars into two groups to make this comparison. The first group of stars had masses ranging from about one third to one half that of the Sun. The second group contained stars with masses only about one tenth that of the Sun, which included relatively massive brown dwarfs, objects that do not have sufficient mass to generate self-sustaining nuclear reactions in their cores. The researchers found that, relative to their total energy output, the more massive stars in the first group produce more X-rays than the less massive ones in the second. To find out how common planet-forming disks in the groups were, the team used data from NASA's Wide-Field Infrared Survey Explorer (WISE) and, in some cases, ground-based spectroscopy previously obtained by other teams. They found that all of the stars in the more massive group had already lost their planet-forming disks, but only about half of the stars in the less massive group had lost their disks. This suggests that X-rays from the more massive stars are speeding up the disappearance of their disks, by heating disk material and causing it to "evaporate" into deep space. 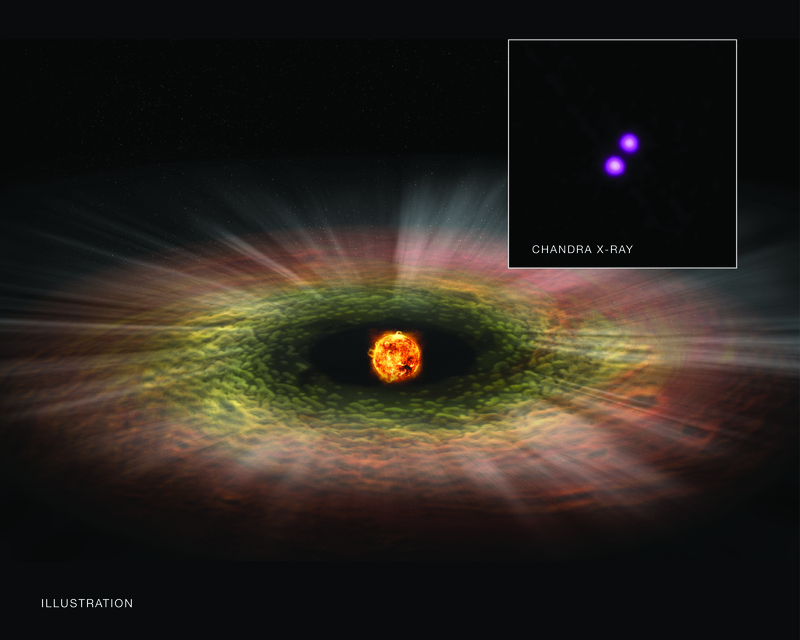 A typical star and planet-forming disk from each of these two groups of stars are shown in the illustrations. The illustration above depicts one of the relatively high mass stars, which has a large number of flares and spots. This is a sign of its enhanced X-ray production, which is thinning and destroying the remnants of its planet-forming disk. Another illustration (below) shows one of the lower mass, fainter stars. Because it is not as active in X-rays, it has retained a thicker disk that represents a more suitable environment to form planets. The planet formation process would cause gaps, not shown in this illustration, to appear in the disk. The streams near the center show how matter from the disk is still falling onto the star. These illustrations, which are not to scale - the stars are actually miniscule in size when compared with their surrounding disks - are accompanied by a Chandra image of young binary star system that was included in the new study of the TWA. In previous studies, astronomers found that 10-million-year-old stars in the Upper Scorpius region, another star-forming group, displayed a similar trend of an increase in the lifetime of disks for lower mass stars. However, the Upper Scorpius work did not incorporate X-ray data that might offer an explanation for this trend, which is one reason why this new study of the 8-million-year-old TWA is important. Another reason is that theoretical models of the evolution of planet-forming disks generally predict that the lifetimes of disks should have very little dependence on the mass of the star. The new results for the "puny" TWA stars point to the need to revisit disk evolution models to account for the range in the X-ray outputs of very low-mass stars. In searching for planets outside of our Solar System, many astronomers have focused their efforts on observing stars less massive than the Sun, like those described here. Such stars may offer some of the best targets for direct imaging of exoplanets in the so-called habitable zone, the star-to-planet distance range where liquid water could exist and life may eventually flourish. These low mass stars are also attractive targets because they are relatively faint and planets in their habitable zones should be easier to detect and investigate. These results appear in The Astronomical Journal and are available online. The authors of this paper are Joel Kastner (Rochester Institute of Technology), David Principe (Universidad Diego Portales, Chile), Kristina Punzi (RIT), Beate Stelzer(INAF Palermo, Italy), Uma Gorti (SETI Institute), Ilaria Pascucci (University of Arizona), and Costanza Argiroffi (INAF). Coordinates (J2000) RA 11h 21m 17.20s | Dec -34° 46´ 45.50"
Observation Time 4 hours 10 min. A group of stars which on average is about 160 light years from Earth. About 179 light years from Earth.